This year we saw entrees at the Ioco Super Stars drop - and overall numbers at Trials events have seen a decline out West. - Not the case in Eastern Canada, where they host a lot of Vintage Trials , and of course Quebec is a strong Trials area. The sport of Trials, in Canada, has always been “Up & Down” - riders come riders go - for whatever reason. - at the moment, we get a lot of calls from Enduro guys, who want to learn how to ride like Graeme Jarvis, !! - I could write a book on that one. Want to try one of these ? Come talk to me at Revvy this weekend. Steve Holcombe (Beta) is at the Italian Enduro this weekend and is seen here flying high at the MX Test today. Final bit of news - Marc Marquez is on pole for the Dutch Moto GP - Cal Crutchlow and Valentino Rossi are also on the front row. What to do on a Thursday !!! A buddy phones and suggests a ride ? - Wow! what could be better, except that I had just prepped my own special Beta Evo 200 for young Bodi Watts to ride in Revelstoke. - Sold the other new 200 Beta the day before !! Anyway, I took the Westside road today to meet up with Steve at Bear Creek -(Going through the Kelowna Traffic is such a drag) - now you might recall. that our old “Staging” area has been closed off, since a vagrant caused a forest fire there last year. - So Steve and myself headed up Bear Main. - Stopping at the first cattle guard. Anyway, We headed up the hill, while all the time I’m trying to figure out how to get to our old stomping grounds - suffice to say that we made it - via a long loop over the top from the forestry road - Nobody has been down this trail this year and it is pretty rough from the winter snow melt, plus we had to clear a few branches, but the route is now secure for all our Trials riders who wish to tackle the old sections. ( Yes they are still good) plus the trail ride is fantastic. Over on the West side of the Mountain, we saw a number of deer - but they really weren’t worried about us. We made a number of stops to take a breath (for me) while I explained to Steve where we had sections all those years ago. Vertigo Motors regrets to announce that, exclusively for industrial reasons, it has decided to end its contract with trials young prospect Arnau Farré. From the Factory, we want to state clearly that Vertigo has no doubt about Farré’s talent and projection to become one of the best trials rider worldwide, and so, this isn’t the reason for such a decision. The deal with Farré was specifically linked to the development of the Vandal model, which because of promotional goals, was meant to compete in several international Championships during the season. However, following product development issues, Vertigo has decided to stop temporally its launch, and with that, also all the activity and presence of the bike in competition, what means the Vandal won’t be competing neither in the Spanish Championship or in the TrialGP Series from now on. We want to state as well, the fact that the rider has received the entire economic compensation of the contract in force, giving him the chance to find new opportunities and challenges in other brands or structures as soon as possible. Brake lever tip in microfusion with new design, better ergonomics and grip. Gear lever tip in microfusion with new design, better ergonomics and grip. Forged exhaust supports with silentblock. New setting on rear shock absorver. New plastic protector for the filter box. New adjustment on front fork. So here we are heading into the biggest, long weekend of the year, and for lots of Trials enthusiasts - that means a trip to Revelstoke. - for Round #1 of the WTC National Trials Series. - This year, the event will feature a long figure eight (30km) loop (gas stop midway) through the lush trails overlooking the Columbia River Valley. - Florian Schott is the Clerk of the Course, and along with Shane, Chris, Terry & Leigh, has created a stunning loop, suitable for all abilities. While most people will camp out across from the MX Track - there are lots of Hotels and Motels in the area, but please be aware that Glacier House, is booked solid for a wedding party. As usual Julie and Judy will look after the scoring, with the tents set up in front of the newly erected Grand Stand at the MX Track. For spectators, this has to be one of the easiest Trials to watch - as you can drive your family car - up the fire road, and see a lot of the sections. Any questions on the event - please either call or email me . We plan on being there Saturday afternoon. As I think we have everything pretty much caught up - Tiffany drove in from Squamish yesterday to pick up the last Evo 200 we had in Stock - so today I plan on sneaking out for a ride. Will have more on this later. Roger sent me this pic of a couple of old Beta Alps - owned by a friend he visited up Island last weekend - I’m still mad at myself for selling the mint one I had. Sammy had a mixed day at the Rocks & Logs - He told me it was very tough and very humbling for him riding the Pro Class - He ended up 6th overall. - Here he is being interviewed before the event. This weekend is the “BIG” one - The WTC Round #1 at Revy - knowing what the lads have got in, I wish I was 20 years younger- err - maybe 40 years younger . Anybody that misses this one really does miss big time - . NO excuses. ( Two guys are driving from Yellowknife !!!!!!!!) - I should mention that while the $30 entry fee may seem a bit much for some people - $10 of this goes back to the Revy Riders club for the use of their trail system. The weather in the Valley has sure been interesting this past week, with storm after storm - power outages and lots of trees blown down - I wonder how many out on our Trials loop for the weekend? Looking ahead - it should be perfect for our WTC Trial at Revy - although the July long weekend is always busy on the roads, so please take care, when driving. 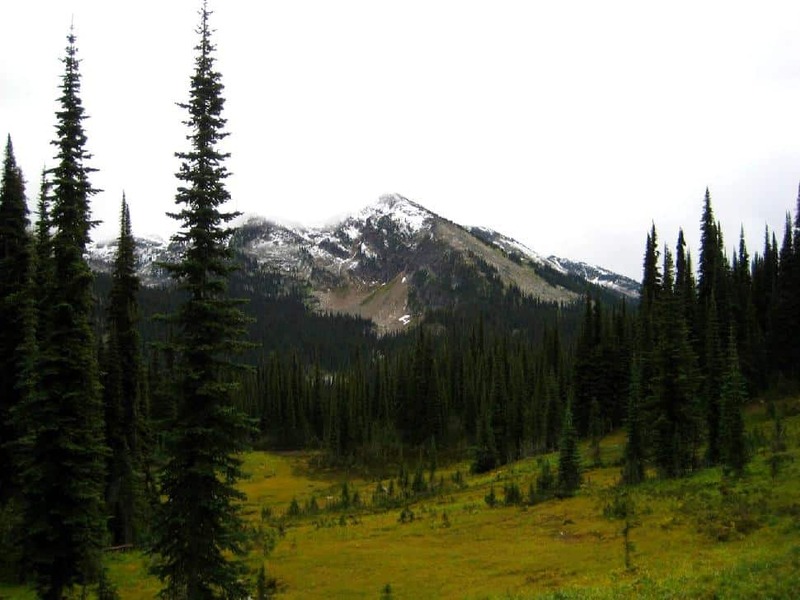 Although the Trial is just one day - Revelstoke is a wonderful place to visit, with lots of other stuff to do, so maybe take that extra time to go to the large Train museum or some of the other attractions. local lad Malcolm Hett for taking the Expert win at the Calgary Rocks & Logs - here are some other results - not sure what happened to Sam. It was a great day up at the Vernon Clubs family day yesterday - the location is quite far out - way above Lavington - not sure of the elevation, but it has to be around 5,000 feet. The weather was perfect, bright sunshine all day, and the previous rainy days, made for great traction on the Trails - I thought the Organizers did a great job - very Professional with different routes for the whole family to enjoy. - We had the Trials bikes on display, and chatted to a lot of old friends - one lady told me that her late husband rode in Calgary Trials with me back in the early 70’s -his name was Adrian Damini - it took me a minute to remember him, but I told her that I have a good black & White photo of him somewhere in my archives - will try to find it. They had 80+ registered riders and it was great to see the young kids having fun - well done all the Volunteers. Results from the World Round in Portugal - Bou makes it a 100 wins, and Raga falters. UK Beta rider Billy Green has won the 125cc class in Portugal. Jitsie have been covering these World Trials with a pretty young lady giving live video coverage, which can be seen via Face-book. This is just one of a bunch of pics I took on Saturday at Revy - I can honestly say that the lads have done an outstanding job on all the sections that I saw, and with a 30 km loop (split in two) the riders get to see some of the spectacular scenery in the rain forest. The plan as with all WTC events, is to keep the sections as natural as possible, while catering to all abilities. - The location also makes it easy for spectators to drive around the Forestry road and view some of the hazards, without having to hike too far. Some free camping is available across from the MX Track and Motels can be found by clicking onto the Chamber of Commerce site posted in earlier blogs (scroll back) Note! The Glacier House Resort is booked completely for a wedding. We are all loaded up, ready to head to the Vernon Club’s “Half Throttle” family event up on Vernon Mountain Will post some pics later. Friday turned out to be an OK day - my Opti Shipment arrived in Kelowna, so I was able to pick that up and deliver some, before stopping by to see Paul & pick up our nice waterproof punch cards for the Trial next week. - Then it was take the back roads out to the Hwy to avoid all the traffic turmoil around Reid’s corner, and after another quick oil drop at Fermco - it was home for a late lunch. The afternoon was spent unloading & sorting, plus adding my Evo 200 for the trip to Revelstoke today - we will take some pics and gather all the latest info on the Trial for posting on the blog. Dougie Lampkin has found himself another job this year - testing the qualifying section at the World Rounds - here is a pic of him Friday in Portugal. And here is the video clip - his time was 45 seconds after a “%” on his first attempt - should be interesting to see what the Super Stars do today. Looks like James Dabill (Beta) was top of the heap in qualifying at Portugal. A customer from Moose Jaw called to say he had his trailer and bikes stolen - the Trials bike is an older Rev 3 which has USD forks - so not many of those around - keep your eyes open for any super deals on either that or a KTM. Don’t forget tomorrow it’s all happening up on the hill above Lavington - We will be there with a couple of our sweet Trials bikes for you to drool over - plus answer any questions about the sport. The photo above shows the TRS Factory set up ready for the World Round in Portugal this weekend - Pretty Professional and I can’t imagine how much it costs for all this. - Although Trials bike sales are small, compared to Enduro - most of the Factories have these expensive rigs - a long way from the early days of the sport, when Mart & Dougie Lampkin etc, would sleep in a tent. Defending champion Toni Bou - Repsol Honda continues his quest for an incredible twelfth consecutive World crown this coming weekend at TrialGP Portugal, round four of the 2018 FIM Trial World Championship. Back on the calendar after a two-year break, TrialGP Portugal returns to the small town of Gouveia on the edge of the beautiful Serra da Estrela Natural Park for the first time since 2004. Huge, imposing boulders will feature heavily and riders will need to demonstrate courage and technique in equal measure. As promised, we had a thunderstorm last night !! and it was a big one - I don’t think we have heard anything like it in Vernon - I kept checking the large tree in our front yard to make sure it hadn’t been hit by lightning. - Hopefully all this hasn’t added more Forest Fires- ironically yesterday was the first day of Summer !!! So today, my schedule is all ready for a trip to Kelowna, to pick up a large shipment of Opti Oil - plus some punch cards from the printer. Of course all this depends on Day & Ross Trucking, and whether they got it on the overnight truck from Vancouver. - Trying to get supplies in a timely manner is always a hit and miss thing. - That old saying “If things can go wrong - they will go wrong” - seems quite normal in the Motorcycle Industry. Tomorrow - I will be heading over to Revelstoke to meet up with Florian, to check out some of the stuff planned for next weekend - The loop this year will be a long one, with traditional style sections, and I will have more to report on this on my Sunday blog. NOTE : This will be a great event for all classes. The temperatures in the Valley remain super hot, making for much outside work not an option for the old guy - I try to get out early before the sun gets too hot. However, Dominique stopped by yesterday afternoon, and I fitted a spark arrester to her Beta Evo - the new “Made in Canada” units are fairly easy to install, but take a little longer on the Beta Muffler. We have heard from Gord Rinke, with some great video clips of his ride at the Whiskey Gulch Trial in Montana - some big rocks, but Gord said his TRS ran perfect, and feels the bike has improved his riding. Unfortunately, Gord has to work all the long weekends as a Fireman, so misses out on most of our events. The Red Bull “Rocks & Logs” goes this weekend at Blackfoot Park in Calgary - We will not be there this year , but wish Sam King good luck - seems a very long time ago, since I attended the first ever big Moto Cross held at this venue, back in 1969 - the event was televised for “Wide World of Sports, and shown on TV. - The promoter was Roy Healy. It was Ron Mallet - President of the Calgary Motorcycle Club, who first arranged to lease this Property for Motorcycle use - a very smart move, considering how expensive Real Estate is these days. - Ron sadly died from brain cancer at age 51 - a great loss to Alberta and Canadian Motorcycle sport. Walt Healy was a big part of the Calgary (and Canadian) motorcycle scene back then, and without his help, many young enthusiasts, may have been lost to the sport. The World Trials Circus, moves to Portugal this weekend , before taking a Summer break - it will be interesting to see if Albert Cabestany and Jeroni Fajardo can keep their pressure on Toni Bou, after the close battle in Andorra - Raga and Busto will also be out to make amends for their poor result last week. You are currently browsing the outlawtrials.com weblog archives for June, 2018.